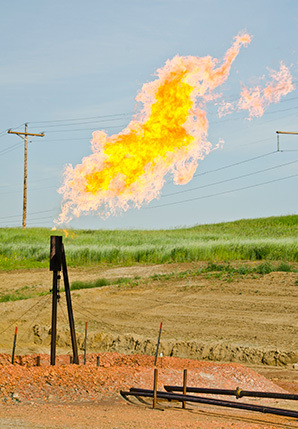 A natural gas flare on a family farm in North Dakota. Photo by Tim Evanson, courtesy of Flickr. The fine print, however, is that natural gas may be as detrimental to the climate as coal in many ways. Its climate challenge lies not during electricity generation, but further upstream -- during extraction, processing and distribution of gas from the oil and gas wells to gas burners. So far, no one -- not industry, academia or government -- has a good grasp on how much methane is leaking from natural gas production. Scientists have been racing to find out, but the fact-finding process has been slow, partially because of the relative opacity of the industry. Scientists who have measured methane emissions over gas fields in the Uinta Basin of Utah say emissions are close to 9 percent (ClimateWire, Aug. 7, 2013). U.S. EPA suggests a leakage rate of 1.2 percent -- equal to the annual emissions of 112 million cars. Their task was complicated because natural gas, oil and coal are all roughly similar. Extraction of all three releases similar byproducts -- methane and ethane, among others -- to the atmosphere, albeit in different quantities.